Almonds recipes | 855 Indian badam recipes | Almond recipe collection. 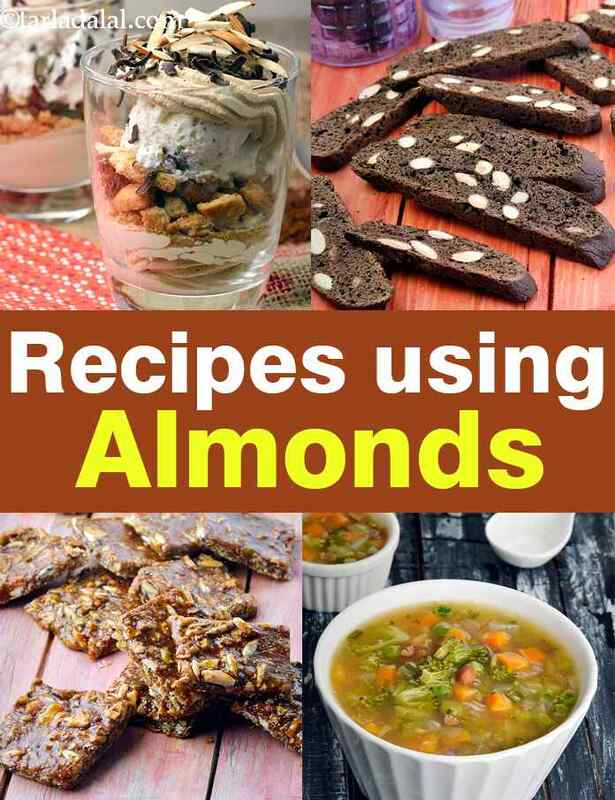 almond recipes. Indian badam recipes. Almond, even though considered to be a nut, is actually a seed of the fruit of the almond tree. Nevertheless it is known as the kind of nuts as it is extremely healthy in many respects. Almonds have a brown skin/coating and are off-white in color from the inside. They are slightly sweet in taste which makes them a delight to eat even raw. They also provide a very rich, buttery taste to all the dishes they are added to. They are used quite a bit in Indian Cuisine, for both savory and sweet recipes. The nutty taste they provide to sweets results in the richness. Due to the crunchiness and nuttiness of almonds it is added to many recipes. The churma in Dal Baati Churma has a really nice texture because of the mix of almonds, whole wheat flour and semolina, deep fried to perfection. Almonds form the base of the Pasanda-style or Mughlai cuisine which is very famous in India. Peshawari Paneer is an example of such a recipe. This dish is rich, with soft paneer and flavors of coriander and red chillies coming through beautifully. Nawabi cuisine, as the name itself suggests, is a royal cuisine. All the food belonging to the Mughlai cuisine is one which feels very luxurious and hence the Nawabi paste, a thick paste used for gravies in restaurants, uses almonds in its recipe. This makes a very flavorful Nawabi Curry that goes well all types of vegetables. Almonds in all forms are welcomed in Indian Desserts. An age old recipe which is liked by all is Almond Sheera. This sheera is eaten as a dessert and is usually served at religious functions. Come to think of it, almonds are a very popular choice for Indian desserts. Almost every dessert has some or the other element of almonds in it whether whole, crushed or chopped. As a garnish and a crunchy element they are sprinkled over Mawa Pedas, the silky smooth Sevaiyan Kheer and even over the delectable Rajasthani Chenna Malpuas. Mohanthaal, a famous Gujarati besan based sweet, is a medley of different flavors. The cardamom, pistachios and almonds really come through together. Even though it is shaped in diamond or square shapes, it has a sort of crumbliness to it that is imparted by the mawa. A Chikki is a sort of praline made with dry fruits. The dried fruits and the sesame seeds are added to melted jaggery and ghee and then left to cool down so it sets properly and holds its shape. With the boost of veganism all around the world, the popularity of Almond Milk is increasing. This is a safer and healthier replacement for those who have issues with dairy or have chosen to go vegan. Biscotti, a special type of biscuit that is baked twice, is usually made in many flavors but the most famous of the lot is Almond Biscotti. The fragrance of vanilla and cinnamon really add to this recipe which makes these biscuits the ideal tea time snack. If you want to know more about the Uses of Almonds, then you can check out our article on that. Enjoy our almond recipes. Indian badam recipes given below. Chinese cooking depends on a blend of various ingredients and condiments rather than the taste of individual ingredients. This recipe is a good example of harmonious and subtle flavours marrying together to create a simple but stunning dish.